Bout of Books Sign Up ~ Love.Life.Read. I love Bout of Books read-a-thon. Have you ever participated in one? If not, kick off 2015 with a bang by participating in this go with the flow read-a-thon. 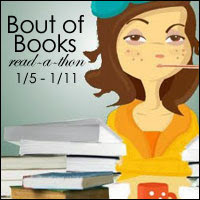 Come participate in Bout of Books with me! I love doing bout of books! I still have yet to sign up for this one. I have to get on that. Good luck and have fun.